Angela Clark set up Valued Support Services in December 2013. She spent most of December, January and February, researching, doing her branding, getting a website up and running as well as starting the VA Mastery Course run by VACT. In March, Angela realised that if she wasn’t proactive then she would still be in the same position this time next year – feeling highly motivated by all the things she was reading and learning but with no clients. So Angela went along to an Athena Network lunch meeting and believes it was the best thing she could have done. The group of ladies were friendly, welcoming and so interested in finding out about her and her business that she joined at the end of the meeting since she felt so comfortable and supported. Now Angela has 3 clients on her books. One has come directly from the Athena Network group, the others have come via friend and family connections. She has found that the more she talks about her business and what she wants to achieve, the easier it becomes talking to prospective clients. She has had several referrals through Athena and although not all of them have come to anything, that’s ok. She thinks it’s actually been a great way to learn to say no – something as an Executive Assistant she found hard to do. I would highly recommend finding a networking group you feel comfortable being a part of. Apart from the plus of people being happy to recommend you, you build an amazing network of supportive, like-minded business owners, who want the best for you and your business and are more than happy to help you achieve your goals. With regard to the 3 clients I have, one is a project where the other 2 are ongoing. I think I have secured the work because I have shown them that I am proactive and extremely organised – traits that were high up on their list. Get out there and talk about your business as much as possible and find a networking group that can help support and encourage you on your business journey. Great work Angela! a good example of how taking action and telling others about your business pays off. Next articleAre you promoting your business benefits to attract more clients? Joanne Sparkes has run Expedio Virtual Assistance since 2003 and was probably one of the first Virtual Assistants in the UK. She specialises in data analysis and spreadsheet automation and in assisting consultants in the scientific medical industry. Join us and every couple of weeks we’ll send you a round up of articles, news and events in the VA world straight to your inbox. Your VA services are too expensive aren’t they? Need help finding your next blog topic idea? 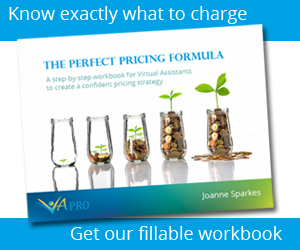 VA Pro is the #1 resource for virtual assistants in the uk with regular articles, how-tos, software reviews, coaching and information to support you and make your virtual assistance business one of the best.